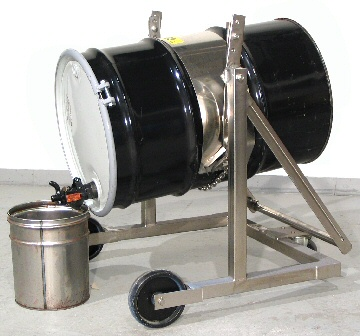 Morse Mobile Drum Carriers make it easy to raise, transport, rotate, tilt and drain your heavy 55-gallon (208 liter) drums. Mobile drum carriers provide remarkable versatility! Drum carriers the full weight of your drum and allow you to rotate your drum 360 degrees, yet lock the tilt angle of a raised drum. Morse drum carriers provide remarkable versatility! Drum carriers the full weight of your drum and allow you to rotate your drum 360 degrees, yet lock the tilt angle of a raised drum. Easily pour or dump the contents of your drums. 80C MOBILE-KARRIER, 21"-23" DIAMETER STEEL DRUM, CAPACITY: 800 Lb. 80i-SS MOBILE-KARRIER, 55-GAL. STEEL DRUM, ACCEPTS DIAMETER ADAPTOR, TYPE 304 STAINLESS STEEL, CAPACITY: 800 Lb. 80AM MOBILE-KARRIER, 55-GAL. STEEL DRUM, SPARK RESISTANT PARTS, CAPACITY: 800 Lb. 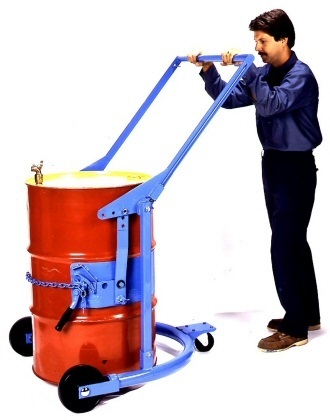 80i MOBILE-KARRIER, 55-GALLON DRUM, ACCEPTS DIAMETER ADAPTOR, CAPACITY: 800 Lb. 80APS MOBILE-KARRIER, 55-GALLON POLY OR STEEL DRUM, CAPACITY: 800 Lb. 80A MOBILE-KARRIER, 55-GALLON STEEL DRUM, CAPACITY: 800 Lb. Drum carriers provide remarkable versatility! Drum carriers support the full weight of your drum and allow you to rotate your drum 360 degrees, yet lock the tilt angle of a raised drum. The mobile drum carrier is effortless to move and steer on its 8" MORtuf polyolefin roller bearing wheels and 4" swivel caster.